They say good help is hard to find these days, and for a man of discriminating requirements it was also hard in the early 19th century. I became aware of the great 19th century journalist, politician, and agrarian William Cobbett last year while reading Farming for Self-Sufficiency, which used his amusing quotes as the epitaph for almost every chapter. Cobbett was an early advocate of going back to the land, and even at the beginning of the 19th century he was critical the way the Industrial Revolution changed man’s relationship with food. I’ve been reading the collection “William Cobbett’s Farm Book”, where his delightful eccentricities and biting social commentary are consistently on display. One of the most amusing parts is his very specific wanted ad for a farm hand. It isn’t like any classified ad I’ve ever seen. Well, so far some of that is normal, such as wanting an obedient laborer. I’ve never seen a printed ad which puts such a low bar for literacy. Most amusing, you can see that he doesn’t cotton to city folk, with the requirement of distance from the cities. From here, it goes into some of Cobbett’s greater eccentricities. It’s hard to say how normal it was to demand that level of obedience from a 16 year old laborer in the early 19th century. So for Cobbett this means Tories need not apply! 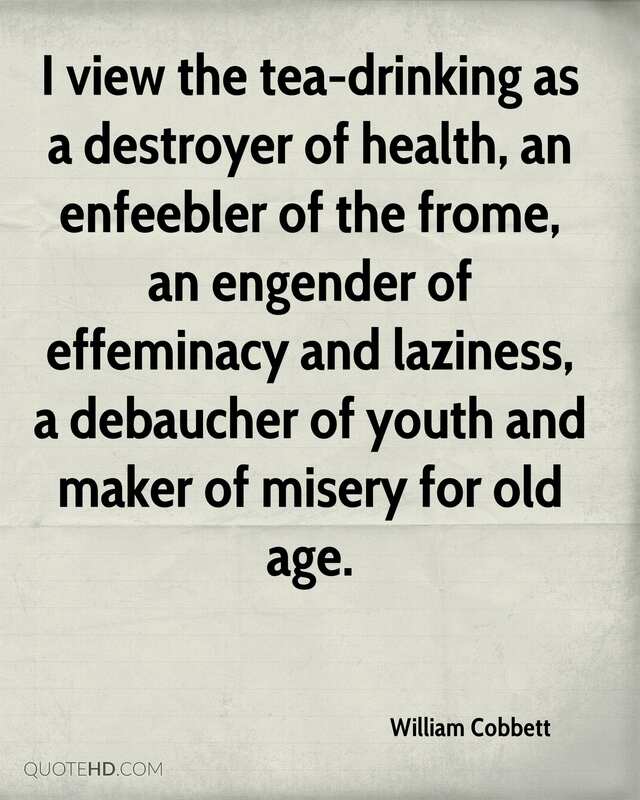 Cobbett really hated tea, for some reason that is unclear to me. It is mentioned in Farming for Self-Sufficiency that for some reason Cobbett thought caffeine was the path to depravity and the gallows, and that you should give your children beer instead. I found the anti-slavery sentiment as well, since Cobbett was a bitter political rival of the great abolitionist William Wilberforce– and it appears that really was all over Cobbett’s hatred of the protectionist “Corn Laws“, which Wilberforce supported. It’s always nice to see someone else who shares my hatred of schools! So that’s what Cobbett needs: a stout and fit lad who has been on an English farm his whole life, away from the city, hasn’t been to boarding school, doesn’t consume caffeine or sugar, supports the Liberal party, is not related to any government employees, and is fine being confined to his place of employment besides to run errands and go to church. Do you think he found anybody?